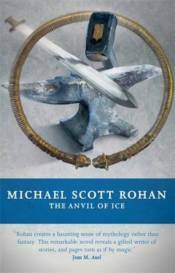 The first volume of Michael Scott Rohan's acclaimed The Winter of the World sequence. The chronicles of The Winter of the World echo down the ages in half-remembered myth and song - tales of mysterious powers of the Mastersmiths, of the forging of great weapons, of the subterranean kingdoms of the duergar, of Gods who walked abroad, and of the Powers that struggled endlessly for dominion. In the Northlands, beleaguered by the ever-encroaching Ice and the marauding Ekwesh, a young cowherd, saved from the raiders by the mysterious Mastersmith, discovers in himself an uncanny power to shape metal - but it is a power that may easily be turned to evil ends, and on a dreadful night he flees his new home, and embarks on the quest to find both his own destiny, and a weapon that will let him stand against the Power of the Ice. His wanderings will bring him great friends but earn him greater enemies, and eventually they will transform him from lowly cowherd to a mastersmith fit to stand with the greatest of all men.